It's Not Work, It's Gardening! : I'm all ears! 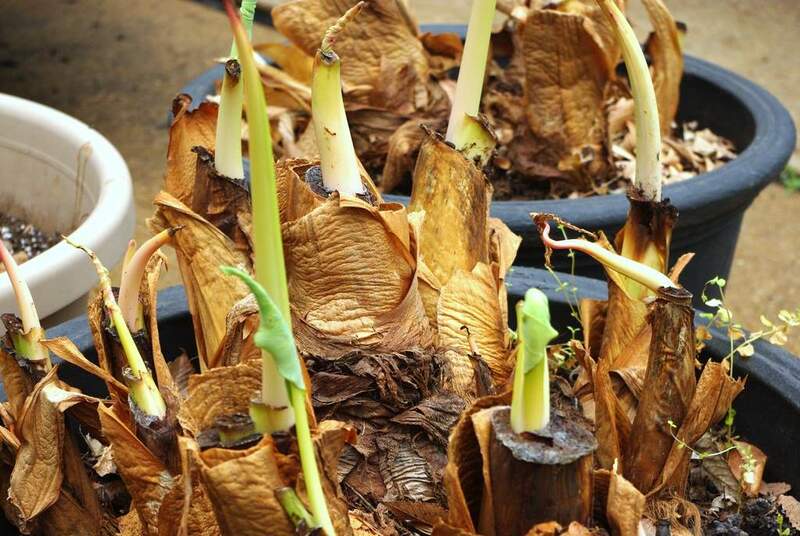 The last of the plants that were stored in my garage this winter are the Elephant Ears. Apparently not only will I never need to buy another one of these again in my life, but nobody I know will ever need to either. 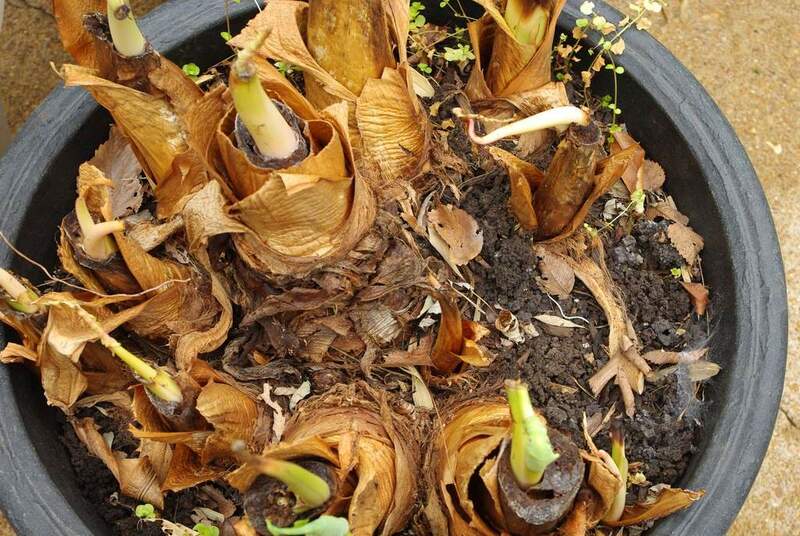 It seems there's no wrong way to store these and have them survive the winter -- as long as they don't freeze. Two autumns ago I just left them in the large pots, then dragged the pots out in the spring. This year I left three of them in their large pots, but also stored one bare on a shelf in the garage. Since they're starting to wake up now, it's time to get them out of the garage. Based on how large they got last year (their second in the same pots) I didn't feel like I could leave them in the pots again as they'd be totally crammed in there by the end of the summer. 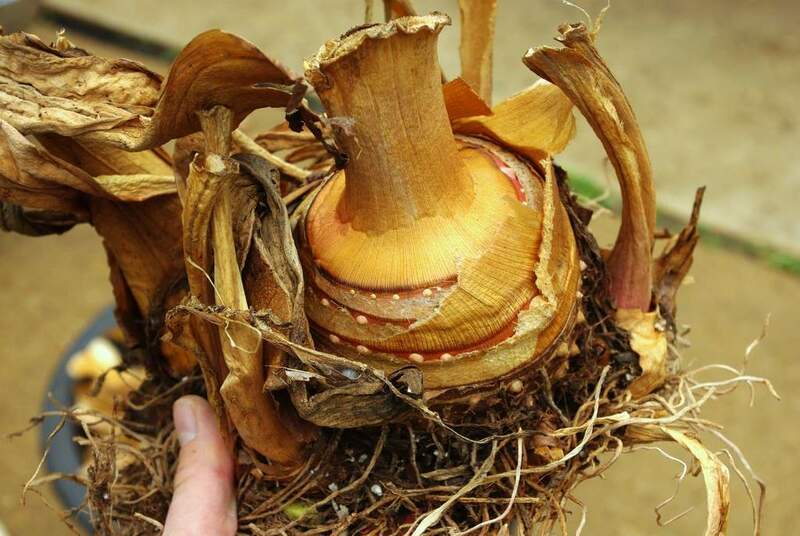 This must be what you can purchase at the stores, but they obviously strip off all of the dead parts and the roots, leaving just a brown, hard bulb, looking like a little coconut. 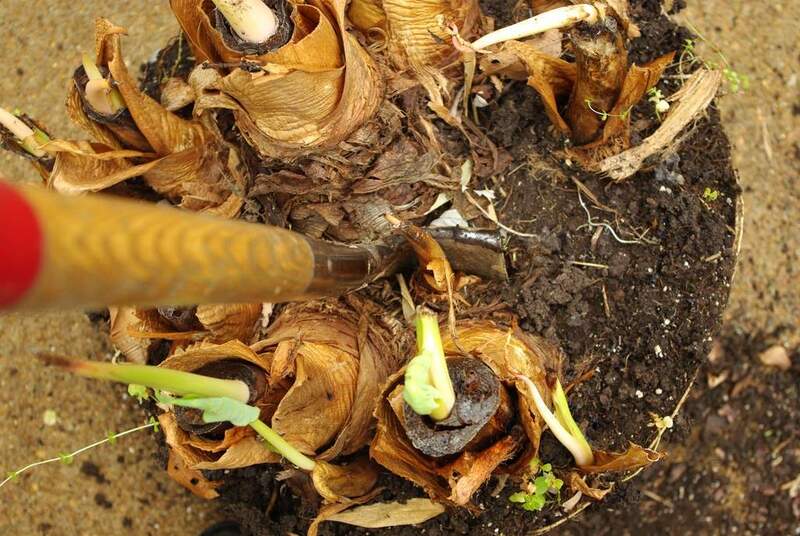 That's what all of these plants came from: a few little bulbs that were about 2" (5 cm) in diameter. 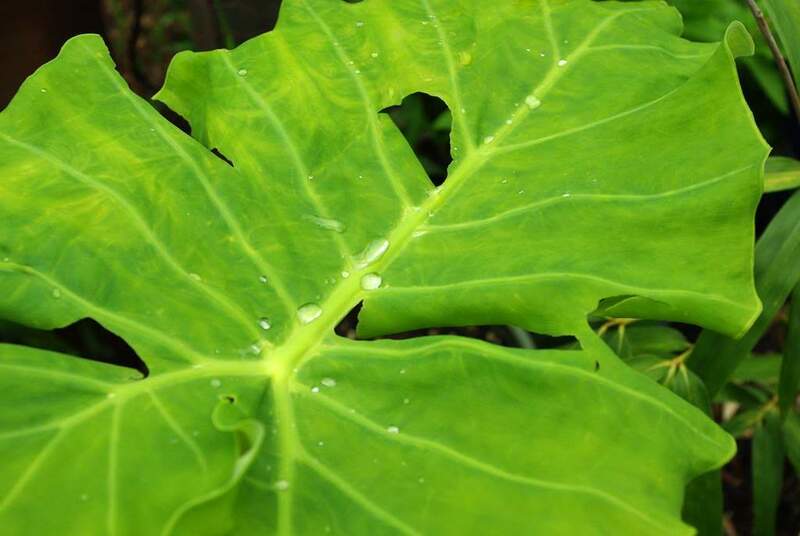 A surprisingly large plant can grow from one of those in the first year if given fertile enough soil and plenty of water. 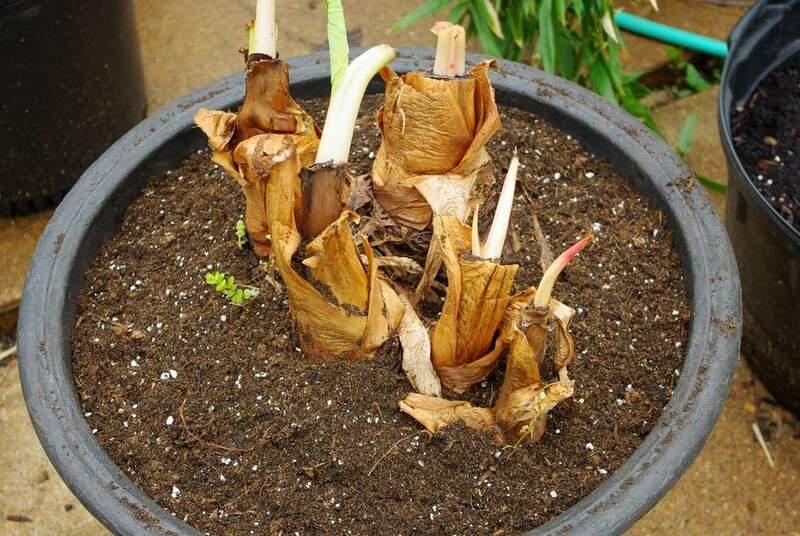 I'll plant them up anyway as an experiment. Like my experiments with grass divisions, I'd like to know how small a part will turn into a viable plant. It's still large enough to form an impressive display, but there's room for growth too. 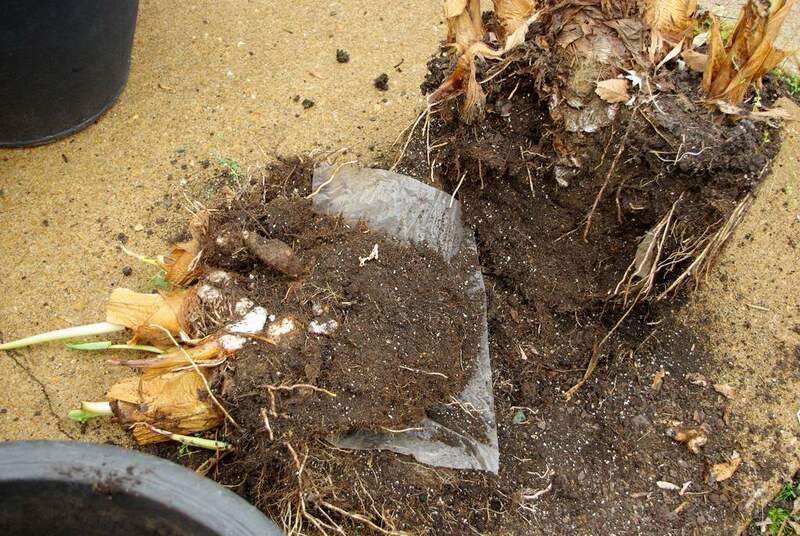 They must have been in need of moisture as the potting mix was really getting dry. 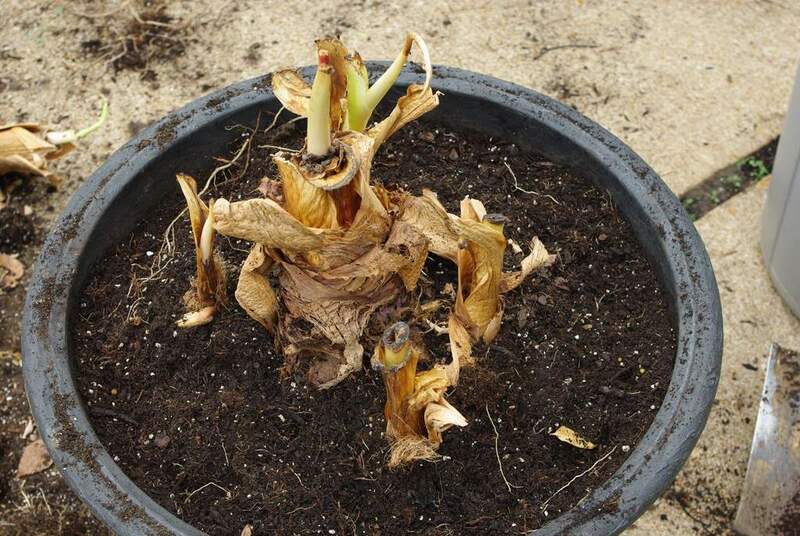 I put some of them back into the container, and others into other large potted plants. 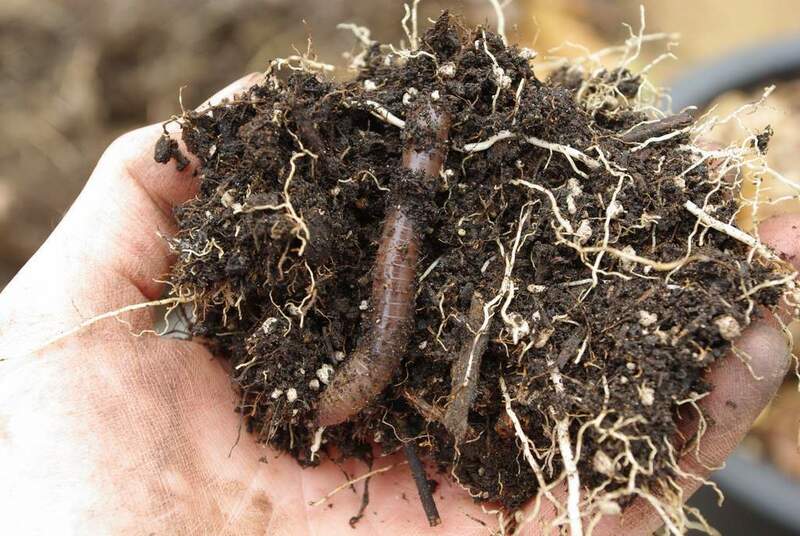 When releasing earthworms, let them go on the surface of the soil -- don't bury them. 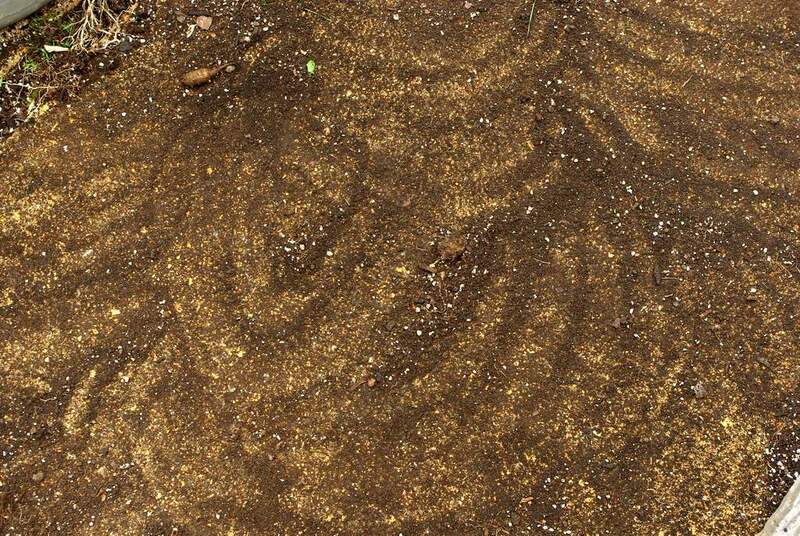 Let them find their own way into the soil. Burying could injure them, or at least that's what I've read. It makes sense to me though. 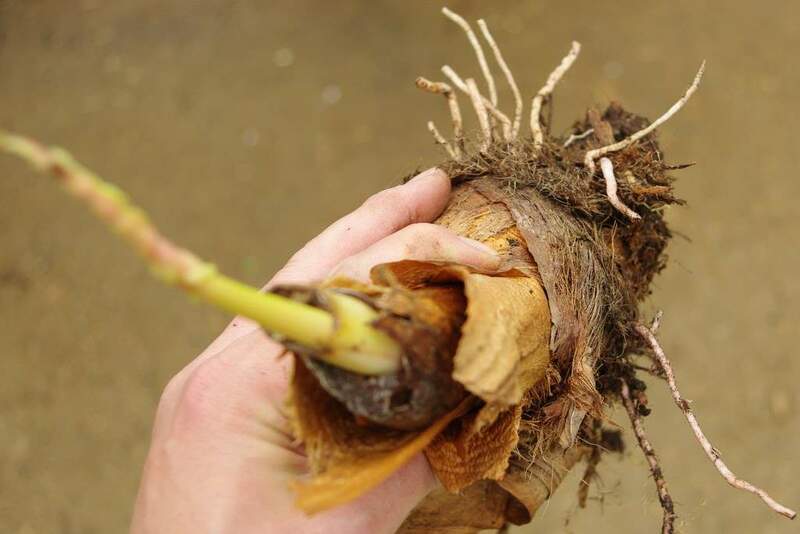 When breaking them apart I did my best to keep some roots on each section. 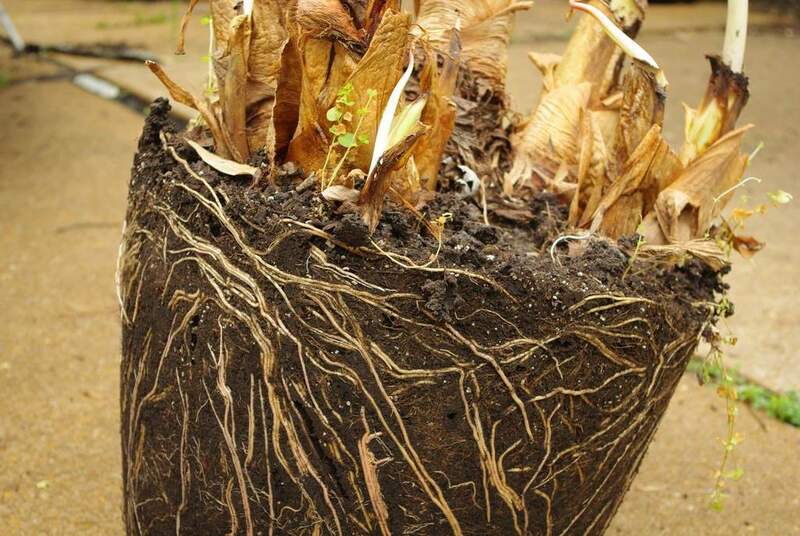 Although they'd do fine without the roots (they'll grow more) they'll grow faster if they have roots already. The plant that I sliced with the spade created this sticky "gel", which formed cool twists and twirls. This must be a type of "clotting agent" to keep the wound from losing too much "sap" (if that's the right word). I've seen a similar thing before when several years ago I cut grapevines that were growing in my trees. The leaking sap ran like water from the cut vines, but after a few minutes had formed "icicles" of gooey stuff like this. 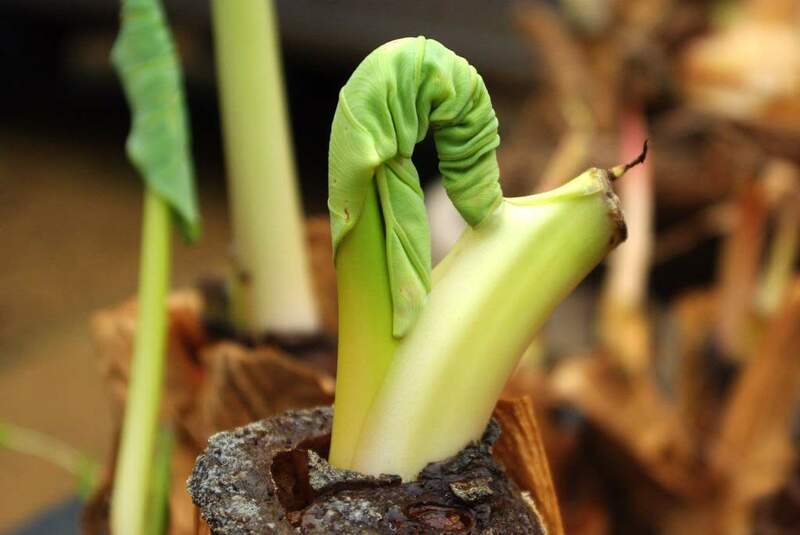 Colocasia gigantea with hail damage. The fact that we've had a hailstorm before the end of April is pretty significant. Last year I believe we never had a single one -- which was unusual -- but I guess I'd rather have one before everything is leafed out than in July when there are dozens or hundreds of huge leaves to shred. Driveway cleanup is the last step. I'm trying to prevent my driveway from looking like a working nursery, and cleaning up after each project, but it's sort of a losing battle. 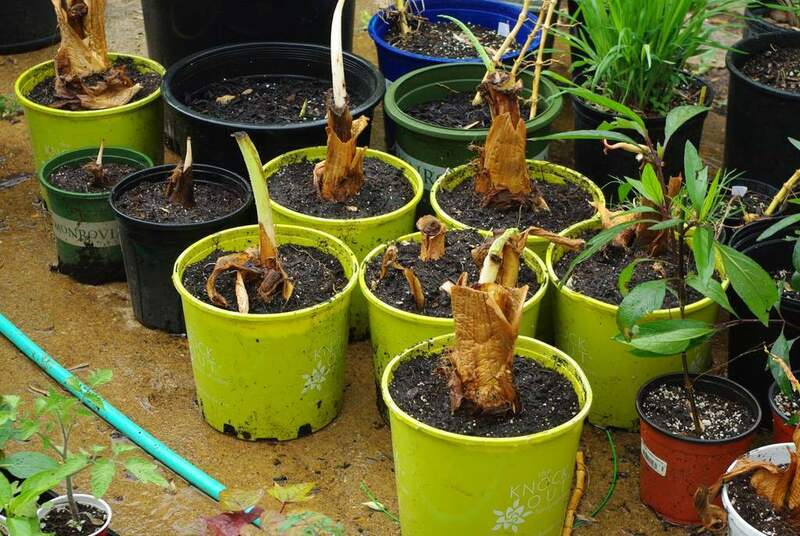 Especially since I've just added a dozen or more potted Elephant Ears to my already large driveway collection of potted bamboo rhizomes that were dug this spring. My goal is to give many of these new plants away to neighbors and friends, so these pots won't be around for the whole summer. I hope. Why do I love the plants that propagate themselves so vigorously? It was very interesting seeing how these grow. Our EEs are in the ground so I have no clue how large their underground structures are. 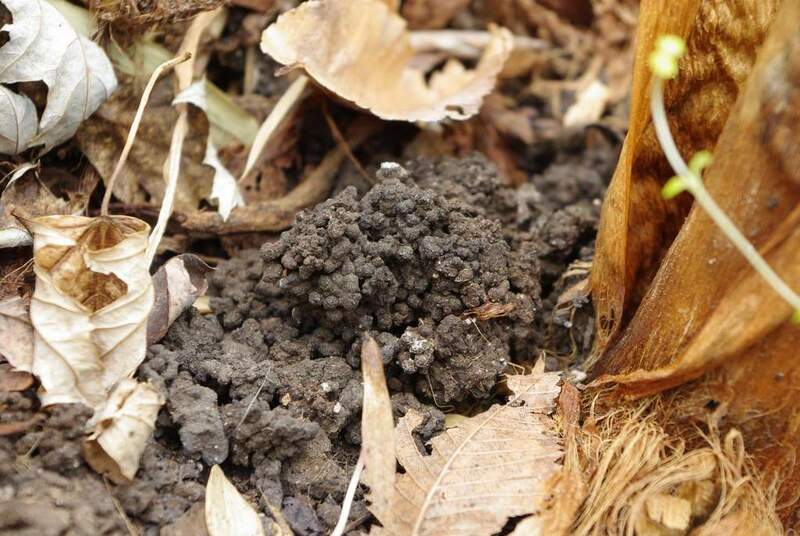 I dumped a bag of composted steer manure on our tropical bed earlier in the spring so hopefully our EEs and gingers will explode this year. 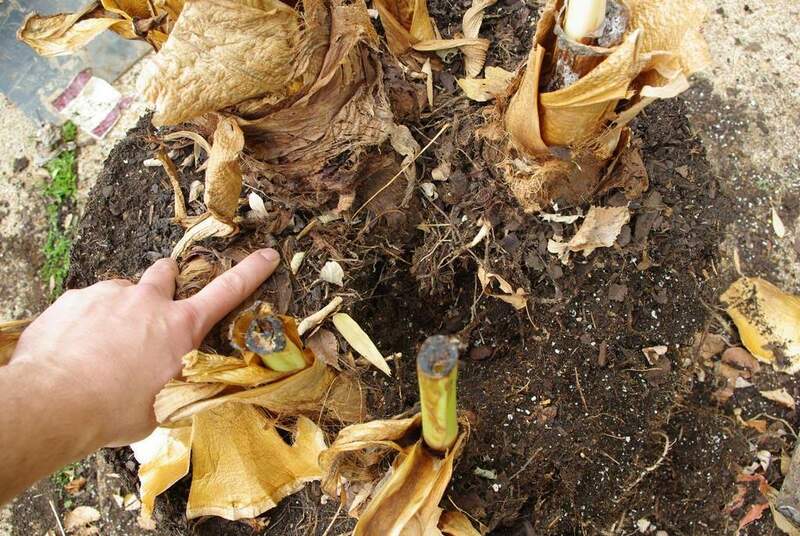 Elephant ears are a close relative of Amorphophallus, and their starchy tubers are used for food. 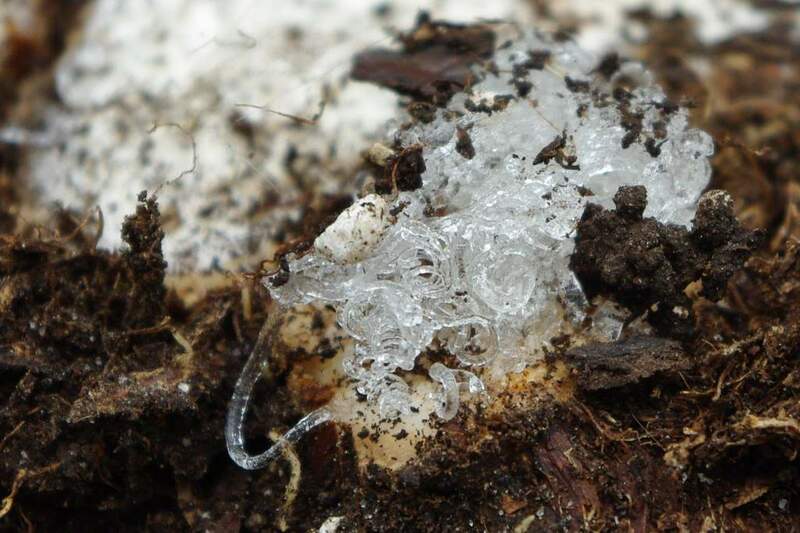 When starch from A. konjac corms is mixed with water, it forms a thick jelly. 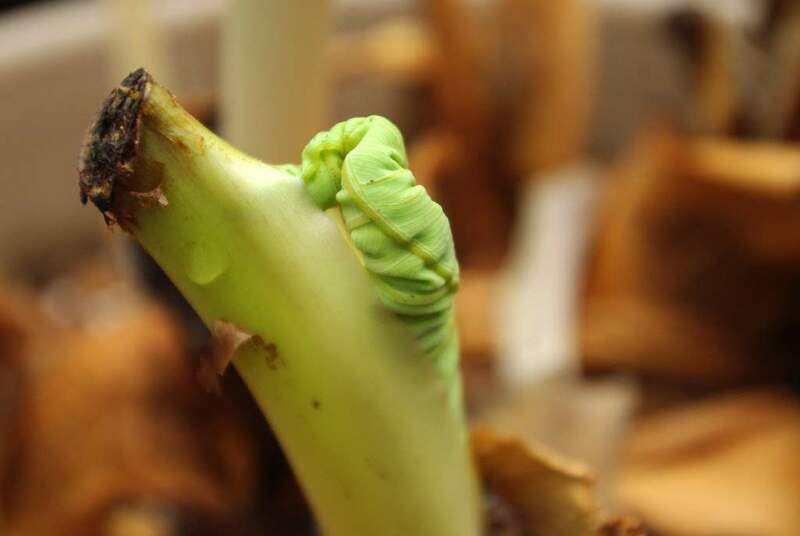 Maybe it's similar to what came out of the elephant ear tuber. If you ever want to read a very interesting book on worms: The Earth Moved by Amy Stewart. That is one thick worm you found! 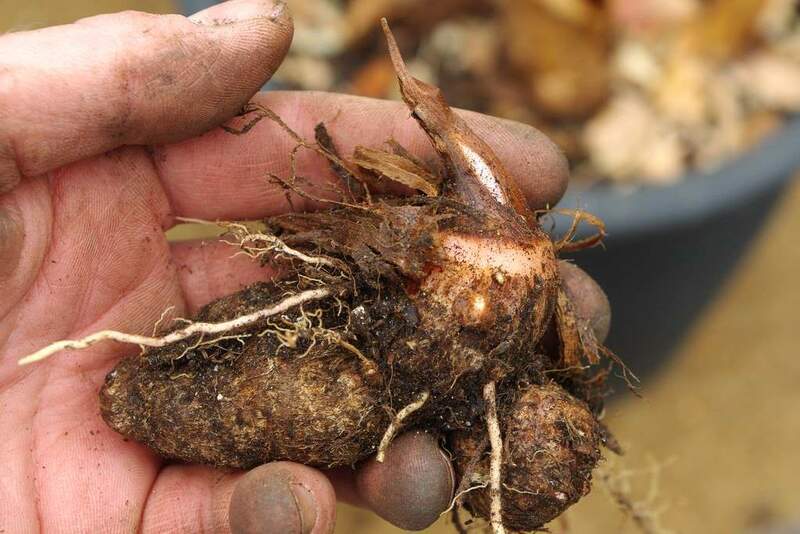 I could definitely use a couple tubers if you don't need them. 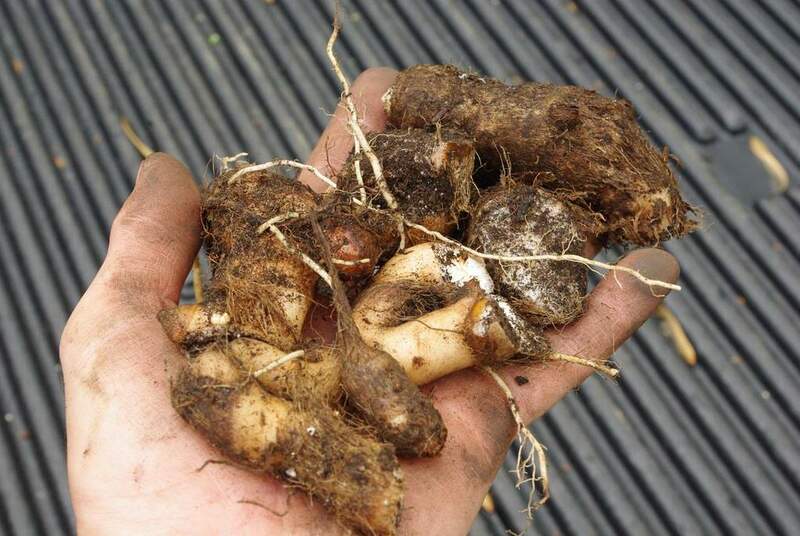 They look kind of like banana corms, however I think musa basjoo corms are probably some of the hardiest since the cold never fazed them after uncovering them. This is one of my favourite foliage plants, just because it seems to lend instant atmosphere to the garden. On another note, the "working nursery" look is in vogue with some other gardeners I know too! It's part of having a gardener's garden I think.